Is Active Noise Cancelling Better Than Passive Noise Isolation? Vote for Your Favorite Noise Canceling Wireless Headphones! Jump to: Bluetooth ANC Headphones | Wired ANC Headphones | What to Expect from ANC | Noise Cancelling vs. Isolation? Related: Want noise cancelling earbuds/in-ear monitors? Click here. Here you can find the alternative, best noise isolating headphones. Here you’re going to find the top models of over-ear and on-ear headphones that have the best noise-cancelling technology right now. You can avoid the noisy office and enjoy some peace and quiet on the commute to work. Compare them to each other in the comparison table or read the in-depth reviews at the end. There is a lot of misconception about noise cancelling. Many people don’t even know the difference between noise cancelling and noise isolation even though they have entirely different names and work by a different mechanism. Noise cancelling technology has an advantage when you want to cancel out low-frequency noises while still hear human talk, street traffic or your crying baby. Noise cancelling is effective only at lower frequencies like the humming sound of a plane engine. This makes them the first choice for travelers as they need to hear what is going on around them while enjoying the illusion of a more peaceful environment. This technology is more suitable for people who want to let louder noise in while keeping the more constant and predictable ambient sound out. Don’t forget this comes at a price, you can read more about what you can expect from noise-cancelling headphones below. How does noise cancelling work? All noise cancelling headphones use microphones to know when ambient noise is present. That signal is sent to dedicated electronics which creates direct opposite sound waves that go through the headphones to your ears and thus negate the original noise. This is a much-simplified explanation. Sound isolation uses no specific technology or electronic circuitry, but just the concept of noise isolation. The best noise isolating headphones are usually in-ear monitors and closed-back, tightly clamping over-ear headphones. These two types of headphones provide the best passive noise blocking. With noise isolation, you don’t let the sound in and you also don’t leak the sound out. Here you can find more top noise isolating headphones. This enables you to listen to your music at lower, more comfortable volumes. Not to mention this is healthier for your hearing in the long run. Additionally, noise isolation headphones don’t need a battery and usually, don’t cost as much money and have no major disadvantages. The only disadvantage with noise isolating headphones is usually poorer soundstage, meaning you don’t get the illusion of spacious sound like with high-end, open-back headphones. But if you know which model to pick you can get comparable soundstage even with closed-back design, take a look at Beyerdynamic DT 770 PRO, one of the best closed-back headphones for the price. Review here. Recently noise cancelling headphones have become very popular, but many people don’t realize the disadvantages of noise cancellation. Noise cancelling works and works well enough to give you the illusion of quieter environment which makes listening to music much more enjoyable. At the same time, you can use the NC headphones just for cancelling the noise without any music. Perfect for times when you need to rest your head. Noise cancelling headphones tend to cost more, especially the higher end ones. All the technology, microphones and more sophisticated design cost money. 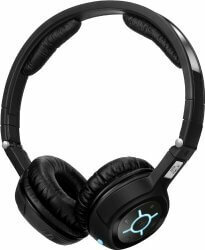 To get decent NC headphones you’ll have to pay money for which you would get non-cancelling headphones with better comfort, better build quality, and especially better sound. Noise cancelling technology produces the counter frequencies to negate noise, but because it’s not 100% accurate all the time you can hear a hissing noise when it’s turned on. Not to mention some of the frequencies in the original music recording will also get cancelled out, distorting the overall sound quality. It is an accepted fact among audiophiles that noise cancelling technology lowers the sound quality of any headphones, even the most expensive ones. But if you don’t have the sharpest ears and value more features and user experience, the headphones on this list are among the best to choose from. Since ANC (active noise cancelling) technology can’t work without power you need a battery, making it less user-friendly. Some headphones use rechargeable batteries, some changeable ones, but overall this means more hassle and expense for the end user. One of the known problems of ANC is strong winds. When strong winds are blowing and making sounds, your microphones pick it up and make a whole mess of the sound you are hearing on the headphones. This is why ANC headphones are not recommended for outside use and can be extremely frustrating if you’re ever caught in that situation. All noise cancelling headphones make you feel like your ears are under pressure and for some this is uncomfortable. There is nothing that can be done about this as it’s just another “feature” of the noise cancelling technology in general. If you’re buying ANC headphones, expect to pay more money for a decent pair, don’t use them outside, keep your mind on the battery and don’t expect superb, audiophile sound quality. In case you value sound quality and don’t want to pay too much money, take a look at noise isolating headphones. Usually, they are cheaper, sound better and offer good protection from outside noise. Bose QuietComfort 35 are the best active noise cancelling headphones right now, period! This is the new over-ear ANC Bose model, the update from older QuietComfort 25. Sure they cost $50 more but offer new and improved features. Bose QC25 are still great headphones if you don’t mind the wires you can save some money and get the same noise cancelling and comfort. Check the QuietComfort 25 here. The QuietComfort35 have now become wireless via Bluetooth and kept the option of using them as wired headphones as well. There are 2 models now. Series I and Series II. Series II is slightly more expensive and has an integration of Google assistant and “Google assistant button” on the side of the earcup. Apart from that, the headphones are basically the same. Same sound, noise cancelling and design with small cosmetic changes. If you use Google assistant a lot get the Series II, otherwise get Series I and save some money. Note: For the best noise cancelling earbuds click here. The combination of everything good headphones need with the best noise cancelling technology currently known to mankind makes Bose QC35 a no-brainer choice. When it comes to active noise cancelling technology Bose is the undisputed champion. Bose QuietComfort models have been stomping the competition for some time now. 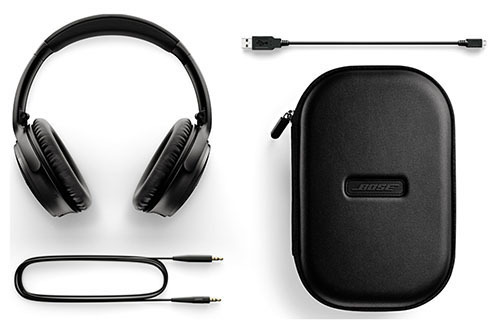 No other company knows how to make their ANC (active noise cancelling) as effective as Bose. QuietComfort 35 are no different, their ANC is superb. Compared to QC25 there is basically no noticeable difference, it still “magically” creates a silent environment with a press of a button. These headphones are top-notch at cancelling out the engine sounds of a plane or people chatter on public buses and trains. They are even effective at cancelling out some middle range tones as well, this is something other headphone brands don’t yet know how to do. If you need some quiet time and your neighbor’s kids don’t let you relax with their loud playing, put these on and you’ll be transferred to another world. Noise cancelling is powered by a rechargeable built-in battery (not replaceable anymore) that lasts about 20 hours in Bluetooth mode or up to 40 hours in wired mode. This is an impressive upgrade from the previous QC25 model which lasted for 30-35 hours on a full battery and only had wired mode. Charging is done with micro-USB cable which is included in the package. Passive noise isolation is good but isn’t superb since ANC technology is so effective. While you might not hear the noise around you, others might hear what you are listening to because there is some sound leakage at high volumes. Nevertheless, for the headphones with the best-in-class noise cancelling, Bose QuietComfort 35 beat all the competition easily. Durability is similar to other QuietComfort models, it’s all high-quality plastics. While Bose isn’t known for top-notch durability they do a good enough job. Bose QC35 are no different. Plastics don’t make these tank-like but if you accidentally drop them a few times they should be fine. We didn’t test this, though. Build quality is great, all parts come together nicely and make the headphones feel premium all around. Quiet”Comfort” is the name of the headphones for a reason. Comfort is top notch, it is true the new QC35 model is slightly heavier than the previous QC25, but you only feel the difference if you wear one after another. If you only wear ones you won’t know the difference. They are super comfortable with big plush, memory foam earpads, headband covered with Alcantara and slanted drivers. The clamping force isn’t too strong and wearing them for hours isn’t an issue at all, you’ll soon forget you’re wearing them at all. Bose knows these will be used on long plane flights so they’ve put extra effort into making them at least as comfortable as older models, meaning top-notch comfort. The ear cups rotate 90 degrees and with headband adjustment, you can make the headphones fit even the largest heads comfortably. Just put them on and relax whatever you’re doing or wherever you’re going the headphones will feel like natural a part of you. The biggest new feature is Bluetooth 4.1. Now you can connect these brilliant ANC headphones with either iOS or Android devices with a click of a button. They’re compatible with iPhones, iPads, Android phones and tablets, Bluetooth MP3players and Bluetooth laptops. Connecting them is very easy and hassle-free. The connection breaks very rarely and the range seems to be better than average in most cases. You can connect them to multiple devices. Once you turn on the headphones turn the power button to on again for 2-3 seconds until you hear the voice prompt telling you the headphones are ready to connect to a new device. Bluetooth has come a long way but still isn’t perfect. You might experience some distortion every once in a while, but far less than with most BT headphones. In case you still want to use the cable, there is a 3.5mm standard analog cable available. You can save a lot of battery power if you use it in wired mode. In case you like having an in-line remote and microphone you can use the cable of QuietComfort 25 with in-line remote and microphone, the same cable is fully compatible with QuietComfort 35 as well. The headphones have solid built-in controls on the right earcup. The buttons are big, sturdy and have a premium feel. Changing volume, songs, play/pause, turning ANC on/off and connecting via Bluetooth is all done from headphone controls. The 2 built-in microphones work well too as long as you understand they’re built-in mics. You can make normal conversation in most environments even outside, but don’t expect high-end boom microphone quality. The mics are quite sensitive and will pick up louder noise around you even if you can’t hear it due to ANC. Nevertheless, in most cases, they work perfectly fine. You get a nice, sturdy carrying case and an airplane adapter since these will be used on planes often. The sound quality is great too. As long as you’re not a purist audiophile you are going to love these. The sound has become a bit richer in bass tones compared to older models (QC25), yet not too much to classify them as basshead headphones. They can’t be classified as neutral either as there is some emphasis on bass. They create a very rich and dynamic sound that is fun to listen to. You will enjoy your pop, dubstep or classical music as they’re very versatile in making all genres sound good. The highs and mids are clear and rich, add in great soundstage and you’re in for a great music experience. Sound separation has really improved and is better than ever before in any of Bose headphones. You’ll clearly hear the different instruments and where the sound is coming from. Now, since the headphones became Bluetooth you can be wondering how do they sound compared to wired headphones. Well, it is true they don’t support aptX, but they sound surprisingly good. While all who have sensitive ears will hear an improvement in sound quality when used in wired mode, for an average listener these will sound great in Bluetooth mode as well. As long as you don’t compare them to high-end audiophile headphones you can’t complain much. There is a bit of harshness and distortion at lower and higher tones when you ramp up the volume to unhealthy levels, but you won’t be using them that way anyways. 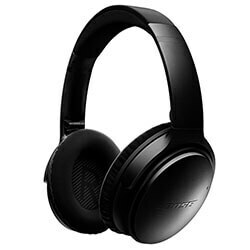 If you want the best noise cancelling headphones money can buy right now, Bose QuietComfort 35 are a no-brainer offering everything a high quality, premium pair of headphones needs. When it comes to a premium listening experience with ANC, few wireless headphones rise to the top like the Sony WH-1000XM2 noise cancelling headphones. Now even though these are promoted as a new model from Sony, they are basically just an update with a rename. As you probably already know, the previous MDR1000X had some durability issues (cracking of headband) which damaged Sony’s reputation. This seems to be an attempt to fix the bad reputation of their first release. The “new” Sony WH-1000XM2 have the comfort and ANC performance that rivals Bose and sound quality that competes with Sennheiser, these are without a doubt one of the best noise cancelling headphones right now. Claiming that the Sony WH-1000XM2 is on par with an effective noise cancellation comparable to Bose models is not an exaggeration. These headphones truly do outshine much of the competition and come close to surpassing the best-in-class noise cancelling technology of the Bose QC 35. There are several ANC modes to choose from as well as an additional feature called “Adaptive Sound Control” which changes depending on the environment. It’s kind of useful but not a game-changer or much of an improvement from the older model. The ambient sound modes allow listening to vocal-only sounds like announcements or normal listening mode so you can stay aware of traffic or other similar sounds. Placing your hand over the right earcup automatically engages the Quick Attention mode so you can hear what is going on around you. It may take some time to dial in the right combination of noise cancellation features compared to the “plug and play” Bose concept, but the effect is noticeable. Add in the option to connect them via Bluetooth and you have a top Bluetooth headphones contender. There’s been a big problem with headband cracking. Sony clearly tackled this problem because the materials used are different. The earcup surface became more rugged to the touch and they probably improved internal structure as well. Now, this model is brand new so it will take more time to see how successful they were at making it “un-crackable”. The design and build quality of the Sony WH-1000XM2 is good. It’s mostly made with premium plastic components. Sony seems to have spent more engineering effort on the quality of the interior electronics as well as the exterior durability this time over. The earcups do fold flat and a hard carrying case is provided to help protect your headphones while not in use. Sony delivers a very comfortable listening experience that allows you to maximize the 30-hour rated battery life. The 30 hours of battery life with quick charging (70min for a 10min charge) is quite an improvement. The earcups have good swivel and pivot range, and the headband is trimmed with very soft padding. Synthetic leather is used for the earcup padding and even covers the outside of the earcup, which makes the WH-1000XM2 feel luxurious to wear and carry. Provided with Bluetooth NFC v4.1 and support for aptX and AAC codecs, the Sony WH-1000XM2 is easy to pair and delivers high-quality wireless audio playback. Wireless range is about 50-60’, so it isn’t the best, but it is perfectly fine for most cases. The updated model had the buttons removed and now everything is controlled with the touch earcup. The touch-sensitive section is on the right earcup and becomes intuitive quickly. Swiping or pressing your finger against the earcup allows you to play/pause, advance tracks, and turn the volume up/down. It may take some time to get used to the touch sensitive controls, but they are very convenient once you get the right muscle memory in place. With this updated model you also get a “Sony Headphones Connect” app which gives you options to change the sound modes. If you want to fine-tune the ANC function than this is somewhat useful. For an average user, you won’t use it much. Sony delivers the sound quality you would expect from a $350 pair of headphones. The WH-1000XM2 sounds great and provides an enjoyable listening experience. The general frequency curve could be classified as a reasonable V-shape with a little bit of lively coloration in the high-frequency ranges. The soundstage is fairly wide, allowing some good space between instruments, but it isn’t super deep. Some genres and compositions can sound compact. Bass frequencies are strong and tight, but there is a hint of over-extension in the sub-bass range when the headphones are driven to high volume levels. Vocals can have some sibilance and sharpness in the higher register (especially female vocals). Otherwise, mids and highs are very well balanced, while being lively and adding a little bit of useful color to the music. As for volume, a greater overall volume is achieved (and noted driver extension) when in wired mode. Wireless listening is slightly attenuated and bass distortion is much less noticeable. If you don’t like the Bose sound signature or need something more comfortable than Sennheiser, these are a great sounding set of ANC wireless headphones. Sony WH-1000XM2 Bluetooth noise cancelling headphones are among the best when it comes to overall ANC performance and quality sound. If you’re looking for premium ANC headphones you should check these out. Besides great sound and build quality, there are lots of additional smart features offered by the Sennheiser PXC 550. The best wireless Bluetooth noise cancelling headphones from Sennheiser. Reliable premium passive and active noise cancelling performance. A closed-back earcup design provides good passive noise isolation. This works well even if you don’t have the noise cancelling circuit turned on. The ANC feature can be turned on with a simple switch, with or without the mobile app. 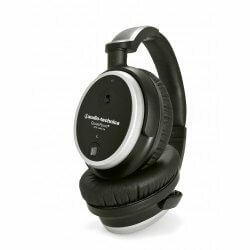 It is also possible to select a reduced or maximum noise cancellation setting for different situations. Non-premium ANC headphones don’t offer that. Noise cancelling of Sennheiser PXC 550 competes very well with the Bose QC35 and Sony MDR1000X. There’s almost no difference. Some users might notice that the Bose and Sony models provide a slightly better noise cancelling experience, but an average user will likely not notice any difference (including myself). You also have an option to turn off the NoiseGard adaptive noise cancelling if you want to tune into your surroundings. Simply double tap the right earcup to activate the TalkThrough feature that allows clear monitoring of the world around you. Quality materials and sturdy design, but a low-quality soft case. Sennheiser delivers a thoughtful design with quality materials used in the PXC 550. There are a few hinge and pivot points that allow the headphones to fold flat. These components are quite robust and work great for daily use. While these headphones do fold flat, they’re still quite bulky, so they aren’t the most compact for cramming in a small space. Nonetheless, these are made for travelers. A soft zippered clamshell case is provided. However, this case may be the least durable feature of the headphones package. It would be nice to have a more rigid case to provide greater protection of the headphones when traveling. Sennheiser provides their standard 2-year warranty, which is better than a lot of other 1-year warranty options from most manufacturers. Lightweight design that is perfect for extended listening. With a lightweight design of only 8 ounces (227 grams), the PXC 550 wireless ANC headphones are great for long flights, commutes, and listening sessions. The clamping pressure of the headband is just enough to keep the earpads snug on the ears without being so tight as to cause discomfort for most head sizes. Large oval earpads allow for plenty of space around the ears, but they aren’t the largest earpads on the market. The Bose QC35 earpads are slightly larger. Ample range of motion is provided with the various hinges and pivot points so that you can easily achieve a comfortable and secure fit. Perfect for long flights and travelling. Touchpad multi-function control and mobile app enhancements. You get many attractive and premium features built into the Sennheiser PXC 550 among great noise cancelling. The touch-sensitive pad on the right earcup provides intuitive control of several features. Simply swipe a finger to turn the volume up/down or to skip a track. Tapping on the earpad will pause a track or accept/end a call. Double tap the touchpad to engage the TalkThrough feature. Bluetooth on/off and noise cancelling switches are provided for easy control of those functions as well. A triple-mic array delivers quality audio for phone calls. The overall performance of this feature is good, but it isn’t the best for loud environments. You still need a relatively calm environment for making calls. One handy feature is the automatic power-on and pairing feature when the headphones are first turned on for use. This works fast and is quite reliable. The music also pauses when the headphones are taken off. Sennheiser offers the CapTune mobile app for additional control of various features, including EQ, ANC levels, and audio streaming quality. It is possible to use these headphones in wired mode with the included 3.5mm to 2.5mm audio cable and a variety of adapters. This will considerably improve the battery life. Inserting the audio cable automatically bypasses Bluetooth operation. The built-in battery provides up to 30 hours of operation on a 3-hour charge via the USB charging port. Quality sound with a full range that doesn’t exaggerate the bass. If you want a set of quality headphones that doesn’t exaggerate the bass or color the sound too much, these Sennheiser PXC 550 cans are the noise cancelling headphones can offer. Sound quality is even better than with Bose if you appreciate a more balanced sound signature. Some noise cancelling headphones can generate extra noise when the ANC circuit is turned on while listening to music, but that isn’t a big deal with the PXC 550. Even though these have closed-back earcups and dynamic drivers, the soundstage is fairly wide. Bass is certainly not overpowering, and the entire frequency range is pleasantly balanced. These headphones are great for listening to jazz, classical, acoustic, rock, and most pop music. Sennheiser’s use of aptX technology means that these sound great when using aptX enabled audio device. Alternatively, you can use the USB cable and connect these headphones to a computer for use as a direct wired connection. Sennheiser PXC 550 headphones sound great, come with great modern features, and perform at a level you would expect from a premium set of wireless noise cancelling headphones. They’re one of the best options in their category. Sony provides a colorful and attractive wireless noise cancelling headphones option with the H.ear on Wireless MDR100ABN series. There is a great balance of sound quality and ANC performance with these headphones that solidly positions them in just about any top 10 list. Sony’s noise cancellation technology is very competitive, possibly surpassing the Sennheiser Momentum series and coming close to the Bose QC series performance. The ANC feature does a great job cancelling out the lows and mid-tone spectrum while allowing important voice information to pass through just slightly reduced. There is only a slight white noise present when engaging the noise cancelling mode, which is much better than many other lower cost ANC headphones. Being made with mostly plastic components allows the Sony MDR100ABN headphones to be fairly lightweight, but they aren’t the most robust. The earcups don’t have a wide range of swivel nor do they fold flat, so excess pressure on that pivot point could cause some strain or light stress fractures. This model seems to have robust electronics and controls, but the built-in lithium battery on some units can have problems charging. You should be able to identify any quality control issues very quickly, so just simply ask for a warranty replacement if you have a bad battery out of the box. The MDR100ABN is a comfortable set of headphones. The duo-toned color-matched earpads are soft and well padded, while the headband offers good foam support. Although not in the same category or comfort level as the best-in-class Bose QC 35 that everyone raves about for comfort, you can certainly have some long listening sessions. The headband can feel like it clamps too tight for those with larger heads, and the smaller earcups may cause mild discomfort for larger ears or when wearing glasses. The lack of a flat-folding swivel range also means that the earcups will not fold flat against the chest when wearing them around your neck. Sony provides a nice zippered carrying case with the MDR100ABN. And you’ll find a 3.5mm audio cable and USB charging cable. All control functions and ports are found along the bottom of each earcup. The control buttons provide a nice tactile feel and feedback, but the layout may be a little too compressed or tight for those with larger fingers. You can connect the headphones via Bluetooth or NFC. Both ways work flawlessly. A long battery life should readily exceed 20 hours, which is great for long flights. The phone call and talkback mic quality is also quite good. The overall sound signature of the H.ear MDR100ABN series is warm and full. Bass frequencies are featured prominently, but not in a way that is too distracting. Sony’s “Beat Response Control” technology works fairly well in tightening up the low-end. That being said, bassheads will likely not be impressed, but that goes for most ANC headphones. The high-frequency performance and range are much more agreeable than the Bose sound that can trend on the brittle side, though some may not find enough sparkle. The range through the low-mids and mids are solid, but not quite as natural sounding as the Sennheiser Momentum series. One thing to note is that there is the potential for some sound leakage, so be aware of that in quiet environments like an office or library. 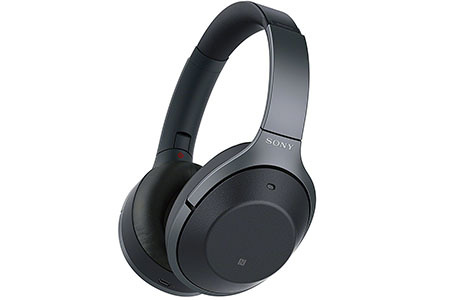 The Sony H.ear MDR100ABN wireless noise cancelling headphones are a good value and alternative to the higher priced Sony MDR 1000x or competing Bose and Sennheiser offerings. And if you want style points, these deliver all day. While Beats headphones aren’t very popular in the audiophile world, this model is very different. … and if you’re looking for a stylish pair of Bluetooth headphones you could do a lot worse than Beats Studio Wireless. Noise cancellation is good, just like with previous Studio model. It’s not top notch like Bose, but you’ll dramatically lower the background noise with ANC on. They have focused on fun sound and design more than on noise cancelling effectiveness. This doesn’t mean you can’t use them in noisy environments, quite the opposite. The battery is proprietary and on one charge gives up to 12 hours with ANC and Bluetooth in use or up to 20 hours with noise cancelling only. The battery is charged via USB to Micro USB cable so any laptop or USB adapter will charge them. The design is top notch. Build quality is decent, they definitely have a very nice, sleek over-ear design. While mostly plastic, it has a nice finish that gives them a premium look… very classy. To make a fashion statement and to let others know you have some style, you probably can’t do better with any other headphones. As long as you don’t throw them around you should get a long life out of them, just don’t expect miracles. 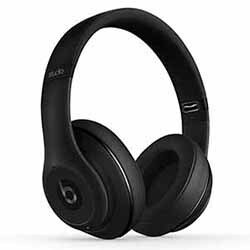 Beats Studio Wireless are very comfortable headphones. Big plush ear pads of proper size make sure of that. They are not the most comfortable headphones in the world, but wearing them for hours shouldn’t leave you with irritated ears. It helps that they’re quite lightweight and don’t put a lot of pressure on your head either. Bluetooth has the standard 30ft of range and connecting to all supported devices is fast and easy. As long as you keep in range no connectivity issues occur. Headphones have a built-in microphone to make calls with and you can also use the added cable (with microphone) to get better call quality. Nicely incorporated “Beats” controls on each ear cup work effectively when in Bluetooth mode. You can control the standard, volume, songs and play/pause. Plug them with the cable and use them as wired Studio headphones, saving on battery power and getting better quality sound. The sound has improved dramatically, comparing them to the old Studio Wireless. Bass is more controlled and not as muddy and boomy as before. It’s still strong but doesn’t overpower other ranges. Overall the sound is a lot more balanced while still keeping the rich bass nature. These aren’t audiophile headphones providing perfect natural reproduction, but rather very fun sounding headphones with emphasis on highs and bass like you’d get in a concert. The clarity of highs has also improved and while the old version had rather aggressive highs, they are now cleaner and more detailed. These are just all around fun headphones with non-fatiguing sound. If you’re looking for stylish, wireless, noise-cancelling headphones with bassy sound and don’t mind the premium price, Beats Studio Wireless are your best choice. Parrot Ziks are another great wireless noise cancelling headphones. This is the first model, but it’s considered better than the 2.0 or 3.0 especially for the price. The newer models are much more expensive and don’t bring anything new to the table. The minimalist design is special and looks nice compared to the alternatives. Noise cancelling is above average. They use their own technology so it isn’t as effective as Bose, but you’re still getting a superb cancellation for all occasions. Over-ear design offers good passive noise isolation as well, but you probably won’t use these headphones without ANC (active noise cancelling) because the sound quality gets much worse. According to Parrot, these reduce up to 98% of background noise using 4 different microphones. This sounds all very compelling, but real life experience is still superior in Bose QuietComfort 35, as said before. This, of course, is a subjective opinion, your experience could be different. The one thing that’s lacking is a good battery. With ANC on and Bluetooth connection, you’re bound to get only around 5 hours of battery life. This increases if you don’t use both at the same time. Build quality is good as you’d expect from around $300 headphones. Nice black finish, durable plastics, and metal parts all make a nice combination. There is really nothing more to say about durability, as long as you take decent care of them you are going to have a great pair of wireless, noise-cancelling headphones ready to go on a trip with you. Because of big padded ear pads, comfort is very good. Over-ear design and its big size help with keeping the pressure even around your ears. Wearing them for hours isn’t really a problem even though they do weight a little bit more than your average headphones. Bluetooth connection works well without issues. It has the regular range of around 30ft after which you’ll start losing connection. One really cool feature is the head detection sensor. What it does, is when you put the headphones off your head, the music stops playing, put them back on and the music resumes without you pressing any buttons. The 5th microphone on headphones is meant for making calls, it works as it’s supposed to. You can clearly hear the one calling and vice versa. You control the music with touch sensor positioned on the right ear cup but only works when connected through Bluetooth. Additionally, you can use Parrot Ziks as wired headphones with the cable that you get in the package. This helps with battery life since it’s so small. Ziks aren’t really made for sports, especially water sports, but there are many good choices for waterproof Bluetooth headphones. Sound doesn’t disappoint, at least when ANC is on. It’s clean and balanced, you can clearly hear all ranges without any of them being too aggressive or lacking. Keep in mind these are Bluetooth noise cancelling headphones which are probably the worst combination for good sound quality so you can definitely find better sounding wired, non-cancelling headphones for the same price. As long as you keep the noise cancelling on you will get one of the best and most enjoyable sounds out of any wireless, ANC headphones. Parrot Zik Wireless have a unique design while offering Bluetooth connection and noise cancelling in one good sounding package, making them on of the best choices in category. 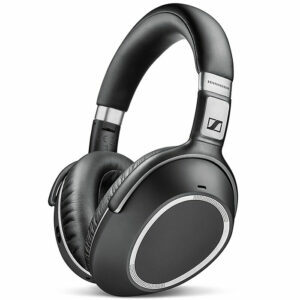 Here are great on-ear Bluetooth noise cancelling headphones from Sennheiser. You probably already know Sennheiser and the many great headphone models they make, MM 450-X are one of them. Noise cancelling is very good, it’s called NoiseGard and it’s the same with all Sennheiser headphones. Now compared to noise cancelling from Bose, these let through a bit more background noise, but you’re getting much better sound quality for a lower price. ANC is powered by one proprietary battery which can be charged by the cable. Unfortunately, you can’t buy the battery in every supermarket or airport shop, you can only order it from Sennheiser. With one charge you can use them for about 8 hours with ANC and Bluetooth in use. If you use them wired, for example, you get up to 20 hours. This isn’t too bad but could be better as we’ve seen from other ANC (active noise cancelling) headphones. Just like most Sennheiser headphones, these are well built. Quality materials with good hinges make them durable even for a frequent traveler. The portable design comes in handy for packing them in the carrying bag and taking them with you. The right earphone has useful controls with which you can change volume, songs, and play/pause. When it comes to comfort, Sennheiser MM 450-X don’t disappoint either. Plush ear pads are soft and you can easily wear them for hours without irritation. They are meant for traveling after all and long trips are pretty common nowadays. Bluetooth works up to 30ft which is more or less standard. You can also use NFC for connection if your music device supports it. To talk to other people while wearing headphones you can use the TalkThrough function. It basically records outside voices and sends it in through headphones. This is useful in many cases, like if a flight attendant wants to talk to you about your dinner. For talking to your friends you can use the built-in microphone but only works in Bluetooth mode. For those you looking for the best wireless sound transmission, these also support AptX compression so you get the best sound quality over the air. Being Bluetooth and noise-cancelling headphones at the same time, this is not a good combination for quality sound, but it’s surprisingly good, comparable to Bose QuietComfort 35. Now, you can‘t compare them to wired, non-cancelling audiophile headphones, but compared to other headphones in the category, these sound like the best of them. As long as you keep the ANC on, sound really comes alive. It’s not flat, but also doesn’t have strong, overpowering bass either. The sound is rather balanced, clear highs, well-detailed mids and just enough bass that’s not fatiguing. Depending on your sound taste, if you like overpowering bass these are probably not for you. Overall, you’re getting portable, well built, comfortable, noise cancelling headphones that don’t disappoint with sound either. MM 450-X are truly another great pair of Sennheiser headphones. Sony MDR ZX770BN are one of the more affordable, high-end headphones with active noise cancelling and Bluetooth. For the price of slightly over $200, you’re getting a lot of value. Noise cancelling can be compared to other ANC headphones on this list, except Bose. Nobody comes close to Bose in noise cancelling. You can expect to cancel out most, lower frequency noises like the engine sounds, air conditioning noise and the like. Passive noise isolation is also quite good so you can use these without noise cancelling as well. The battery is already built-in and you can charge it with the included cable. A one 2.5 hour charge will give approximately 13 hours of battery life with ANC (active noise cancelling), but without it, up to 20 hours. Build quality is above average. They are not built like tanks, but like you can expect from Sony’s these won’t just fall apart. They are very light and might even seem a bit flimsy but both of these headphones are made for traveling so you can be sure they’re up to the challenge. Over-ear design with big padded ear pads is always comfortable and it’s not different with Sony MDR ZX770BN. Bigger size ear cups will be comfortable even for people with bigger ears. The clamping force is quite firm but gets lighter over time. With Bluetooth and NFC wireless connectivity, which will work to around 30 ft range you will mostly use these without wires. They also have AptX support for those wanting best sound quality over Bluetooth, just read the instructions on how to enable it. Microphone for making calls is built-in and works without problems. When it comes to sound, Sony MDR ZX770BN don’t disappoint either. They sound at least a good as other noise cancelling, Bluetooth headphones. The highs and mids are balanced and nicely represented while the bass is quite strong, too strong for those who like a flat response. It’s not audiophile sound quality, but more like casual, fun sound with a nice beat. Sony MDR ZX770BN are perfect for an average consumer who doesn’t care much about sonic reproduction, but just wants to enjoy some modern, fun music with style. Plantronics makes some solid upgrades with the latest BackBeats PRO 2 wireless noise cancelling headphones release. There is a BackBeat PRO special Edition model that costs more money but apart from different color and NFC doesn’t offer much else. 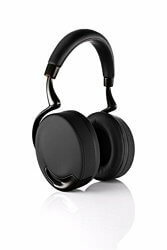 Great wireless range and long battery life are key features worth noting, and there are a few other things you’ll want to know about before buying these headphones. If judged strictly on their noise cancelling functionality, the BackBeats PRO 2 do not blow away the competition. The ANC circuit does work, but it is noticeably less effective than models offered by Bose or Sony. If you’re looking specifically for the best noise cancelling, these might not be for you. But if you want a good mix of music playback quality with added ANC for an affordable price then these are one of the best you can get. Bluetooth works with all smartphones and Bluetooth MP3s for up to standard 30ft (10m). 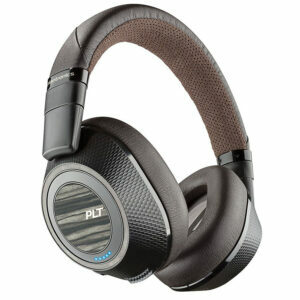 The design of the Plantronics BackBeat PRO 2 is improved over the original PRO version. The earcup and hinge design have been modified for better functionality. Plantronics includes a lot of electronic controls on and around the earcups of these headphones. This adds a little more complexity and possible points of failure. One of the features that can fail or cause intermittent trouble is the automatic pause/play sensor in the headband. Active users may notice this sensor cutting music in and out too frequently, and the biggest warranty claim for the PRO 2 is for broken or malfunctioning controls. The BackBeat PRO 2 is slightly less bulky than previous designs, but the comfort level is still high. The padded headband is trimmed in a breathable fabric, and the earcups have a very soft and luxurious feel. These headphones are quite comfortable and suitable for long flights and listening sessions. With nearly 24-hours of battery life, these headphones will provide plenty of playback listening time. The Bluetooth range is very respectable, remaining connected for well over 100’ in a line of sight environment. The BackBeat PRO 2 comes with a cloth carrying pouch, 3.5mm audio cable, and USB charging cable. The “Special Edition” version comes with a rigid zippered case. Some users will appreciate the open-listening mode that allows ambient sound to be amplified for convenient listening and awareness while wearing the headphones. As noted earlier, there is a sensor in the headband that will automatically pause music when you take the headphones off. This feature works well in most cases, but might be too sensitive for some users. Overall, the BackBeat PRO 2 is attractive and has better style than the previous model. The textured earcup design with faux wood accents looks good. The power and volume output from the Plantronics BackBeat PRO 2 is good, delivering full sound that has been improved over the older PRO model. Listeners of EDM or music genres featuring a lot of bass and pulsing low-frequency energy will likely perceive a lack of articulation as the volume level is increased. Low-mid frequencies are well represented without being exaggerated, but they can trend on the muddy side without a little bit of EQ control. Mids are allowed to keep vocal material front and center without overdoing it. Highs maintain consistent clarity and strength even at high volume levels. When listening to music, the effect of the active noise cancelling feature is fairly neutral – it doesn’t really make any positive or negative impact on the experience. The Plantronics BackBeat PRO 2 wireless noise cancelling headphones are a worthy upgrade and provide great style for a reasonable value. They aren’t the best performing in ANC or bass performance, but certainly worth checking out at this price. Golzer BANC-50 are a hidden gem among Bluetooth noise cancelling headphones. While not the best in any category compared to more expensive headphones, you’re getting very solid value, especially for the price. As the cheapest, wireless ANC headphones on this list, the value per $ is very high. Noise cancelling works well, not as good as Bose, of course, for the price, it’s better than expected. We’d say it has about 70% of Bose effectiveness for low frequencies. Expect good noise cancellation on planes or busy offices, but not a complete cancellation of all background noises. The battery for noise cancelling and headphones charges in about 2-3 hours and gives up to 12 hours of juice. With ANC only you get 30 hours and with Bluetooth, about 15 hours. This is pretty good and can easily compare to more expensive models. When it comes to build quality it isn’t the best. In fact, compared to all other headphones on this list, these probably have the poorest durability. They are not badly made, but they’re also not made out of premium materials like the headphones reviewed above. They are very “plasticy” and don’t inspire much confidence. For the price, they are still well made, like a pair of average $50 headphones. Golzer BANC-50 are over-ear headphones and very comfortable at that. Thick, padded ear pads become softer over time and offer good comfort for long listening sessions. They might not be as comfortable as Bose QuietComfort 35 but still, have above average comfort. The size of ear cups could be bigger for over-ear design as some people find them a bit small. Also, the clamping force is quite strong in the beginning but gets softer after some use. If you’re not traveling all the time and don’t require best of the best, you’ll be perfectly happy with the comfort of these headphones. Bluetooth range is standard 30ft and works well, additionally, you can make use of AptX codec if your music device supports it. A hard, carrying bag is a nice touch, especially considering it’s very common to get only a soft bag with more expensive headphones. The built-in microphone works well and most callers won’t be able to know you’re talking over a headset. Controls on the ear cups function only in Bluetooth mode but otherwise function well. Changing songs and volume is very easy, especially once you get used to the positions of buttons. The wired mode is useful if you want to save on some battery power as you can get up to 30 hours with only noise cancelling on. The sound is pretty good. Not audiophile standard, but for wireless, noise-cancelling headphones the sound is better than average. It’s not completely flat but doesn’t have that basshead lows either. It is something in between. You can find great basshead headphones here. If you’re looking at Golzer BANC-50 you’re probably not an audiophile. Nonetheless, the sound quality is better than with average $100 Bluetooth headphones. Keep ANC on as it makes the headphones sound much better, louder and richer. This has to do with the limitations of noise cancelling technology and not with this particular model of headphones. For the most budget friendly option of Bluetooth, noise cancelling headphones. Golzer BANC-50 offer a nice combination of ANC, comfort, features and sound quality that is very hard to beat for its price. Naztech i9BT are the best budget noise cancelling headphones with Bluetooth on the market right now. There are some other similar models for the same price of around $80, but Naztech i9BT just does more things better. If you have $80 to spend and want noise cancelling Bluetooth headphones, get these and you won’t be disappointed. The noise cancelling is very effective, there is a small switch on the right earphone that turns on ANC (active noise cancelling). It’s not as effective as Bose models, but very close and considering the Bose headphones cost 3 times more you’re getting a lot of value for a lot less money. The battery is better than average. The headphones are charged when you get them and you can use them for around 12 hours in Bluetooth mode with ANC on one charge. The battery life using just Bluetooth is 15 hours per charge and if you use only ANC you get almost 30 hours of battery life. This is comparable battery life with Bose QC 35 that cost 3 times as much. The headphones themselves are quite light and don’t really seem to be extra durable, but over the time they seem to fare better than expected. Made mostly from plastics that is somewhat bendable and doesn’t seem to break easily. If you intend to use the headphones for long plane flights, like most people, their durability is more than good enough. Keep them in the convenient hard carrying case and they should serve you a long time. The comfort of Naztech i9BT is another thing that pleasantly surprises. These are smaller headphones and for most people, they will rest on ears, so basically they are on-ear headphones. The thing that makes them so comfortable are super soft memory ear pads that just melt on your ears. You can easily wear them for long continental flight without feeling any discomfort. For headphones in this price range, this is just a great feature. In the package, you get basically everything you need. Regular 3.5mm cable for use as wired headphones. If the battery runs out you can still use them as normal headphones without Bluetooth or ANC. You get the airplane adapter, 6.3mm adapter, and the USB charging cable. Everything fits in a small cables pouch that you can store inside a hard carrying case. Interested in what are the top gaming headphones? They also have an integrated microphone inside an earphone for when you want to make calls, it works without problems. The only thing they could improve is to change their earphone buttons, they are somewhat small and hard to distinguish so you need to learn the exact positions to use them efficiently. Altogether a very nice package of accessories that keeps surprising. The sound quality is probably the only average feature of these headphones, but this is to be expected as most active noise cancelling headphones lack in this department, even the most expensive ones. The sound signature changes with ANC turned on. Without it, the headphones are slightly bassy and have a warm sound. When you turn on the ANC a lot of that bass disappears, along with background noise of course. They have good sound overall and much better than any airplane headphones you get on board. Just keep in mind these are Bluetooth and noise-cancelling headphones, so you can’t expect sonic fidelity out of these. All in all, for the best $100 spent on Bluetooth and noise-cancelling headphones, get Naztech i9BT and enjoy your music wirelessly in peace and comfort anywhere you go. While Bose and Sennheiser clamor for best-in-class awards, BÖHM delivers a value-friendly set of wireless noise cancelling headphones that sound good and look great. The BÖHM B76 model boasts solid construction and provides clear wireless audio that is suitable for the average listener in search of active noise cancelling. With a noise reduction rating of about 20 dB, the B76 headphones provide a reasonable amount of noise cancellation and isolation. The earcup design and padding help attenuate ambient noise, and the active noise cancellation circuit works to take care of the rest. 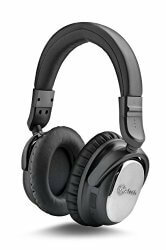 For the price, these headphones perform rather well in this category, providing decent cancellation at a fraction of the budget for a premium brand. The ANC technology isn’t perfect though, as there is a little bit of high-pitched whine when the active noise cancelling circuit is engaged. This noise is easily overcome when playing music, but it is noticeable when using the headphones in ANC-only mode. The physical build quality at this price point is quite good. The aluminum swivel and hinge design that attaches the earcups to the headband is robust and feels solid. As for the interior electronics, there are concerns about quality control that may affect some users. A few users have experienced intermittent electronic noise and sometimes even component failure. Most users report receiving a good set of headphones. Just be sure to submit a warranty claim for any issues if you notice them. With plushly padded earcups, the BÖHM B76 fit comfortably around the ears. Those not used to a closed back earcup design may feel like they are warmer to wear than other headphones, but they are pretty good in this category. The headband could probably use a little more padding. The heavier aluminum components tend to cause a little extra pressure on the top of the head, so some users may experience slight discomfort for that reason. It’s unlikely that these headphones will feel too “clammy” on the head. In fact, users with smaller heads may even feel that the headphones are too large and loose. The B76 wireless headphones feature a 3.5mm audio line input jack so that the headphones can be used with or without a Bluetooth enabled playback device. These headphones come with a semi-rigid zippered nylon pouch and USB charging cable. The right earcup features volume up/down controls with a multi-function button in the middle. ANC controls and an indicator are on the bottom of the left earcup. A 2-hour charge time provides up to 8 hours of ANC use or up to 16 hours of music playback time. The Bluetooth v4.0 pairs quickly with a number of devices and provided reliable audio playback. One notable downside of these headphones is the built-in talkback mic. It is very quiet and generally low quality compared to other options. The BÖHM B76 is available in stylish black/silver or brown/gold trim colors. These headphones aren’t going to blow you away with audiophile quality sound, but they do hold up quite well when you consider their modest price point. The 40mm drivers produce a fair amount of bass that is suitable for most listening styles. However, turning up the volume with bass-heavy genres like EDM may cause some overextension and distortion. Mids are even and clear throughout. And highs tend to be very present, without being sharp or biting. Audiophiles and keen listeners are going to pick out subtle nuances depending on the style of music, but the B76 delivers reasonable audio quality for most users. It should be noted that there is a slight bass boost when the ANC circuit is engaged, as well as a little bit of noise (noted earlier). Both of these issues can happen with a lot of active noise cancelling headphones, especially wireless Bluetooth models. 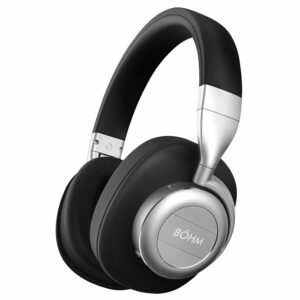 BÖHM B76 wireless noise cancelling headphones look great, provide solid noise cancelling, and deliver good sound for around $100. Not a bad deal. 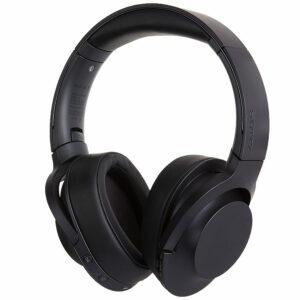 Monoprice Hi-Fi (10010) active noise cancelling headphones are great value for money. You’re getting about 2/3 of the performance of Bose QC 35 for 1/3 of a price. There is no doubt about it, these are slightly worse in pretty much every regard, but for the price, you can’t blame them. Noise cancelling works well. It can’t compare to Bose or to some other, more expensive noise-cancelling headphones, but does a good job. Passive noise isolation isn’t bad either and once you start playing some music, background noise mostly disappears. One AAA battery gives enough power for about 50 hours of ANC. After that, you can still use them as regular headphones. Build quality is good. Ear pads are nicely padded with quality fabric, there could be more padding on the headband, but it doesn’t really impact the comfort. Ear cups are made out of nice, quality plastic that has a nice shiny finish. Foldable design is made with portability in mind. Monoprice PID 10010 Hi-Fi would be a perfect replacement for any of your older headphones. Wearing big, soft headphones usually doesn’t cause any comfort issues, Monoprice PID 10010 are the same. Well, padded, on-ear pads distribute the pressure evenly on the ears and don’t cause any sweating. These are perfect for long plane flights or a busy work day in the office. The cables are detachable, improving durability and making them easier to pack. In the package, you get 2 cables, one regular and one with an in-line microphone in case you want to make calls on the go. You also get a nice carrying bag with additional adapters. Overall, it’s a nice package. Compared to other noise cancelling headphones, these sound pretty good, even on par with Bose QuietComfort 35, but not beating Sennheiser PXC 550 or Sony MDR-1000X. It is true they sound much better with noise cancelling on, but this is a problem most ANC headphones have. Just use them with ANC on all the time. The sound is fun to listen to, without boomy bass or aggressive treble. On the other hand, if you’re an audiophile you can find better-sounding headphones among non-cancelling models. If you want good sound cancellation and sound quality in a comfortable, over-ear design all for around $100, you’d be stupid not to get Monoprice PID 10010 headphones. JVC HA-NC250 are the best on-ear noise cancelling headphones by our opinion. A combination of comfort, durability, great noise cancelling and sound quality for a very affordable price. This is hard to beat. The passive isolation is pretty good, but combine that with effective noise cancelling and you get some very quiet headphones. The on-ear design doesn’t disappoint in this regard. Comparing only noise cancelling technology, Bose might be only slightly better, but you’ll have to pay a higher price and suffer the inferior sound quality. These JVCs are perfect for traveling, working in the office or just enjoying your music in peace. ANC technology requires one AAA battery to function for about 50 hours of use. This is better than average, plus you can put any AAA type of battery inside, no need to get proprietary batteries. JVC builds quality headphones and HA-NC250 are no different. True, they are mostly made out of plastics, but it’s durable plastics that will stand the test of time. All the joints are well made and you can easily carry them with you without worrying about damaging them. For on-ear headphones, these are very comfortable. Light and putting a little pressure on ears you’re going to have a difficult time finding more comfortable on-ear headphones. But just like all on-ears, after a few hours, you are bound to get some tingling in the ears. If you value comfort highly, get an over-ear model instead. You can keep using headphones even when ANC is turned off for cases when you run out of batteries. Headphones fold flat to fit into the included carrying bag making them easy to take with you. They don’t have any volume controls on the headset or microphone for making calls, so you’ll have to chat with your friends through your phone. The sound is really good. All ranges are balanced, the bass is not overpowering and there is little hiss sound so common in noise cancelling headphones. These won’t beat audiophile on-ear headphones, but for a noise cancelling model they sound very good. 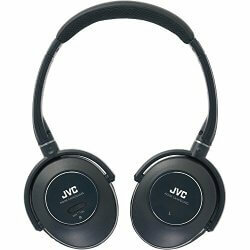 If you want on-ear, noise cancelling headphones that sound good, JVC HA-NC250 are your top choice. 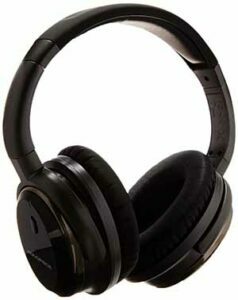 Audio-Technica ATH-ANC7B are the newer version of the popular ATH-ANC7 model noise cancelling headphones. The new model is not much different from the predecessor, but they managed to somewhat fix the issue of sound leakage. When it comes to noise cancelling, it is very good. It’s not as good as Bose QuietComfort 35 of course, but you’ll be able to enjoy your favorite music in relative peace. For only around $100, which is about 3x less than Bose, you’re getting 70-80% effectiveness of Bose noise cancellation. It is noticeable, but when you consider the price it becomes negligible. Passive noise isolation works well too, you can use these with isolation only, even though sound quality takes a dip. In the end, you’ll probably be listening to these with noise cancelling on. The headphones are powered by one AAA battery that gives up to 40 hours of active noise cancelling. This is slightly better than average. Headphones are very well made, definitely better than Bose QC 35. Metal headband and hinges seem strong and able to endure a lot of stress. The plastics used are top quality as you’d expect from good, over-ear, portable headphones. They are on the “bulkier” side, but this doesn’t affect comfort. They are still made for long wearing. Ear pads are nicely padded and don’t put a lot of pressure. Bose QuietComfort 35 might be a bit more comfortable, due to their lightweight, but Audio-Technica ATH-ANC7B are not far behind. No special features, just the basics. Headphones fold flat for easy packaging. Have a regular on/off ANC switch and an in-line microphone that works with most smartphones, nothing fancy, but this is nice to have. Top waterproof iPods reviewed here. Just like with most other noise cancelling headphones you get a carrying bag and a set of adapters, airline, and 6.3mm version. Headphones cost just around $100 which is a very good price for everything you get, making them very good “value for money” noise cancelling headphones. For noise cancelling headphones the sound is very good, most will agree it’s better than Bose QuietComfort models. Compared to non-cancelling headphones, it’s probably just decent. The sound is rather balanced, has nice treble and mids with strong bass that isn’t controlling or boomy. Audiophiles would probably want more clarity, but this is hard to expect from any ANC headphones. Sound leakage has been improved or should we say lowered. People around you will still hear your music in a library at max volume, but on an airplane or in a busy office nobody will be able to pick up your tunes. These headphones suffer from the same limitations when ANC is off, the sound gets worse, loses bass and clarity in mids and treble. Always use noise cancelling mode to fix this. Audio-Technica ATH-ANC7B have superior sound in noise cancelling category, maybe not as good as Sennheiser PXC 550, but close. For a competitive combination of good sound quality, noise cancelling, comfort and durability all for a very good price, Audio-Technica ATH-ANC7B are hard to beat, in fact, we think these are best noise cancelling headphones under $100. Take a poll and vote for your favorite model. 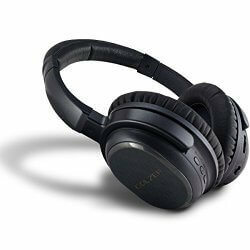 The above headphones are among the most popular Bluetooth headphones with good noise canceling abilities. See best Bluetooth over-ear headphones if you don’t care about having active noise canceling. If you know how much money you’re willing to spend and you pick one of the above, we’re sure you won’t be disappointed. We’d like to hear about your best noise cancelling headphones or just the ones you’re using in noisy environments.